Well I cannot believe that we are in October already it's scary. Well today I fancied doing a bit of messy crafting which I haven't done for a while. Taste of India Indian Lattice embossing folder. I used the A4 embossing folder and distressed the edges using Tim Holtz vintage photo distress ink. I stamped the Tiger onto the Neenah desert storm card and coloured the image with my spectrum noir pens, I used CT1, CT2, Or1 and Or2 then EB2, EB3 and EB5. I used a thin double sided tape and then put on some glitter around the edges. I used the ribbon and gems from my stash. I stamped the sentiment with Stalin ink pad onto the bengals desert storm card, then used my Die'sire die tag to cut it out then I used the distress ink to tie it in with the card. This is gorgeous, love the beautiful background and tiger. I love this image Sam and your fabulous design and detail. Hi Sam, saw this post on Bloglovin, and thought it is absolutely gorgeous, the image is amazing. What a wonderful card! I just love the earth tones you used. 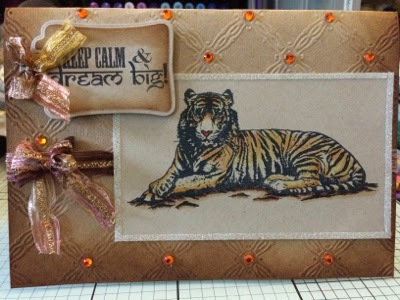 Crafty Gals Corner is currently hosting a DT call. If you have a moment, check them out at: http://craftygalscornerchallenges.blogspot.com/ and if you would like a chance to work with the wonderful sponsor’s then link up your favorite project to apply. Made by Samantha. Watermark theme. Powered by Blogger.